The Lead The Way Fund Lacrosse Day of Champions was an extraordinary day in a town that rightfully prides itself on its extraordinary lacrosse legacy. On Saturday, April 19, Manhasset hosted the first ever Lead The Way Lacrosse Day of Champions fundraiser, established in honor of its local resident, U.S. Army Ranger Sgt. James “Jimmy” Regan, who was killed in Iraq by a roadside bomb in February, 2007. To honor Jimmy’s sacrifice his family established The Lead The Way Fund to raise funds in support of families of U.S. Army Rangers who have died, have been disabled, or who are currently serving in harm’s way around the world. The Lead The Way Fund helps ease the financial burdens faced by the soldiers and their families and provides medical needs, flying a wife to be at her husband’s hospital bedside during recovery, or fill the “gaps” that the Army and other services do not cover. The other sponsor and benefactor of this great day was the newly established Indians Rock Community Foundation which is raising money to help build, repair and beautify the community sports facilities for the community. Hosting a lacrosse event seemed like a natural idea as Regan was an All American high school lacrosse star at Chaminade and a Duke letterman from 1999-2002. In the course of his Duke playing days he earned the Academic ACC Award and ACC All Tournament honors by scoring four goals and two assists during the NCAA championship game. A battalion of volunteers organized the day in a way that the visiting Army officers must have found impressive. With about 6,500 in attendance from early in the morning until after the last firework streaked across the sky, the day was flawless in execution. When six United States Special Operations Command Black Daggers and two US 75th Regiment Army Rangers waltzed down from the sky, red jet streams following their graceful descent, to perfect landings on the field, it was a clear signal that this was no ordinary day. Lacrosse fans were treated to an amazing line-up of games featuring fired-up players who treated each event like a championship game. The day kicked off with the Manhasset 8th grade girls and boys travel teams each playing in a mini tournament. Cheers could be heard up and down Plandome Road when number one ranked Duke entered Ed Walsh Stadium. Moments later more cheers erupted when number 8th ranked Army entered with their black and gold helmets gleaming. This was not just another NCAA exhibition game; this was Jimmy Regan’s alma mater, Duke, playing his Army alma mater. Other than the Duke or Army alumni many Manhasset residents found themselves unsure of which of Regan’s teams they should root for, so they cheered for both. After all, both teams were playing for Jimmy. With ESPNU broadcasting the game live, eventually Duke won the 10-6 match showcasing why they are ranked number one in scoring offense and number 6 in defense in the country. Another Regan match-up was the game between the Manhasset Indians (ranked 3rd in the country) vs. the Chaminade Flyers, ranked 8th in the country. 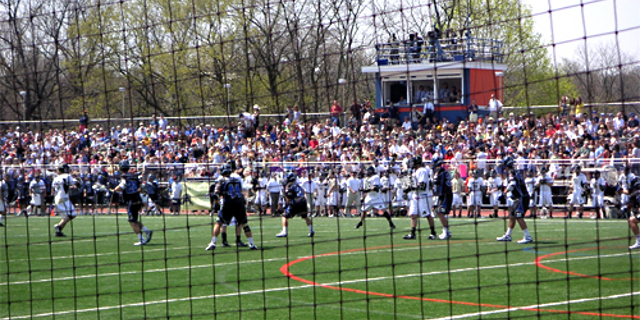 With what seemed an almost equal number of fans for both teams, Chaminade proved itself the better team that day, winning 11-5. A highlight of the afternoon was the Manhasset Girl’s Varsity team playing St. Anthony’s. Regan’s youngest sister, Manhasset senior #10 Michaela Regan scored four goals and one assist, helping her team to a 14-11 victory on this extraordinary day of Manhasset lacrosse history. As the sun set the New York Fire Department and the New York Police Department took the field and delighted the fans with their speed, power, and lacrosse prowess. The crowd was once again on its feet cheering for both teams, and the NYPD Finest won the contest. Standing along the sidelines thoughts turned to the phrase from our national anthem, “And the rockets red glare, the bombs bursting in air” and the ultimate price Sgt. Jimmy Regan paid for his country as fireworks streaked across an inky black sky and marked an end to this historic Manhasset event. Both The Lead The Way Fund and the Indians Rock Community Foundation want to thank their volunteers who devoted their time and efforts to make the day a success. Very special and warm thanks also go to all Manhasset residents for their participation and patience during the day, The Town of North Hempstead, the Manhasset Park District, the Manhasset School Board, Manhasset School District Superintendent, Charlie Cardillo along with Manhasset High School Athletic Director, Carolyn Pagnano and the entire athletic office. Also instrumental in making the immense logistics of the day run smoothly was Manhasset School District Facilities Director, Armand Markarian, and his talented team of Joe Monda and Theresa Manieri. The leaders of both organizations look forward to updating the community shortly with the financial success of the day. The Lead The Way Lacrosse Day of Champions was an opportunity to honor one of Manhasset’s bravest sons, as well to celebrate with friends and extended Lacrosse family an extraordinary day of lacrosse and being together working toward the greater good.